William Thomas was born in late 1890, the son of Thomas Tucker, a labourer for the Great Western Railway, and his wife Amelia née Fewtrell. Thomas and Amelia had eight children in total; two died in infancy, and six survived to see the start of the Great War. It is a sobering reflection of the age to see that seven Tucker infants died in the Newbury district during the period of Thomas and Amelia’s marriage – with this infant mortality rate it is not practical to identify their two lost children. The survivors were William (born 1890), Edwin Maurice (1893), Albert Walter (1895), Bessie (1901), Charles Henry (1904) and Minnie Ann (1907). Amelia died in 1909, leaving Thomas with six children to raise alone, though William and Edwin would have left school by that date and would have been contributing to the household income. Adey's Buildings vewed from Stroud Green. No 12 is the second house in the terrace leading away on the left. 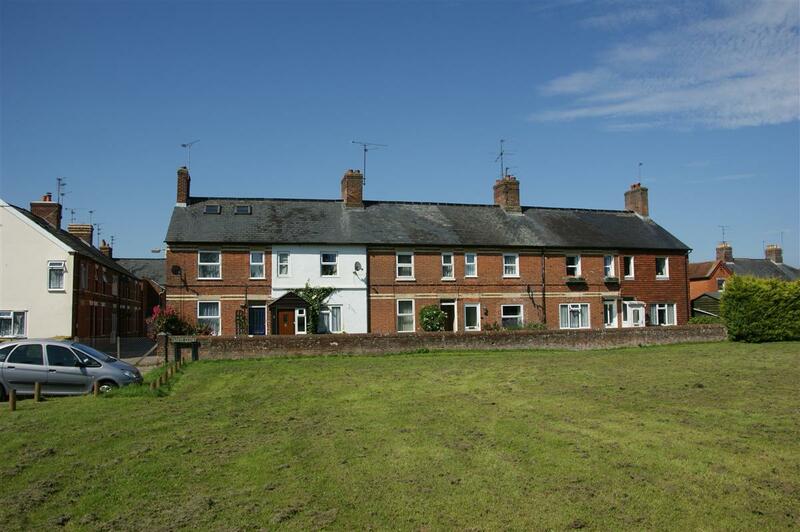 For over 20 years the family lived in at 12 Adey’s Buildings off York Road in an area known today as East Fields – erroneously so because Newbury’s East Field was elsewhere, and until 1878 this area was part of neighbouring Greenham. The house was a typical small Victorian terrace home of the kind built to house the working classes all over the country. The house is still in use today, although it is unlikely to be lived in by a family of eight. However, the Tuckers had a better location than many because a few steps away was Stroud Green - a large open space, traditionally common land. The name of Adey’s Buildings came from John Adey, a builder, who erected the houses and still owned them at the time the Tuckers were residents. In 1912 the family moved from Adey’s Buildings to 17 Railway Road, a similar terraced house a short distance away, alongside the railway; perhaps a little more convenient for Thomas’s work, but not a lot. By the time war broke out in 1914 William was also working as a labourer, a hard life; when he enlisted in the army he may have felt that the life would not be that much harder. His regimental number (18487) suggests that he volunteered in mid-1915 to serve with the local Royal Berkshire Regiment. After training he was sent to France, arriving on 22 December 1915, to join the 5th Battalion of his regiment which was with the 35th Brigade, 12th Division near Bethune enjoying a Christmas break from the trenches. 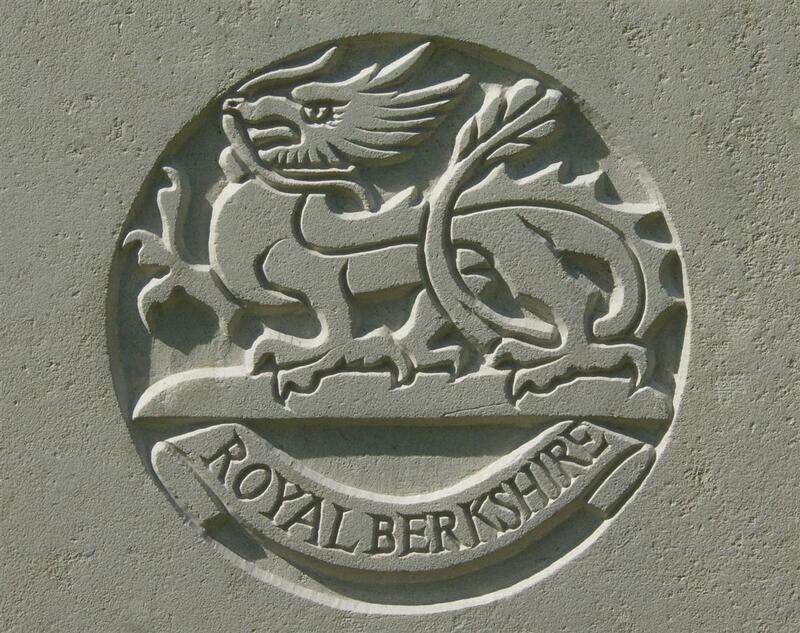 The regimental badge of the Berkshire Regiment, as used on CWGC headstones. This was the scene of the Battle of Loos fought out by the 5th Berkshires and many others a couple of months earlier. Life as a labourer in Newbury probably didn't seem too bad in comparison! Life in an infantry battalion at the Front was hard and dangerous, even when there was no great battle going on; the battalion took casualties throughout the first half of 1916, but not in great numbers. That would change on 3 July, the third day of the Battle of the Somme. The 5th Battalion were part of an attack on the village of Ovillers north-east of Albert, the same village that was assaulted by the 2nd Battalion Royal Berkshire Regiment (and others) on the infamous first day of the battle. Both Berkshire battalions took very heavy casualties; in the case of the 5th Battalion, casualties were listed as 6 killed or died of wounds, 215 wounded and 111 missing (most of whom would later be ‘presumed dead’). The battalion was reduced to a strength of 340 men – half of their number had gone. William may have been one of the fortunate ones who came through without a scratch, or he could have been one of the wounded – though not a serious case for, if he was wounded, he was soon back with his comrades. Before the war it was thought that a unit’s morale would not survive losses of greater than 25% - the Great War proved this theory wrong. The battalion was back in the line almost immediately. A few days later they were withdrawn to billets behind the lines and reinforcements began to arrive from England or from Infantry Base Units in France (including a contingent of 46 men from the Warwickshire Regiment). On 8 August they were back in the line when the Germans made four counter-attacks on their positions. The attacks succeeded in capturing about 50 yards of trenches at great cost in men – but the 5th Battalion also suffered 134 casualties, almost cancelling out the effect of the recent reinforcements. Life then continued relatively quietly for a while; short periods in the firing line were counter-balanced by more restful periods in safer billets. On the evening of the 12 October 1916 the battalion went forward into the support trenches near Flers (Smoke Trench) where they would be in support of the 9th Battalion, Essex Regiment which had just taken over the firing line following an abortive assault by the 7th Norfolks and 7th Suffolks. These three battalions were all familiar friends to the 5th Berkshires as they had fought alongside each other as units of the 35th Brigade since their arrival in France. Sergt Hackett and L/Cpl Cox granted Military Medal for gallant conduct on Sept 25th. TUCKER – Oct 14, killed in action, Pte W Tucker, Royal Berks Regt, son of Mr and Mrs T Tucker, 17, Railway-road, Newbury. William was buried in grave I.B.25 at Bull’s Road Cemetery, Flers. Locally he is remembered on tablet 6 of the Newbury Town War Memorial. William's name on Newbury memorial, immediately above is his brother Walter. 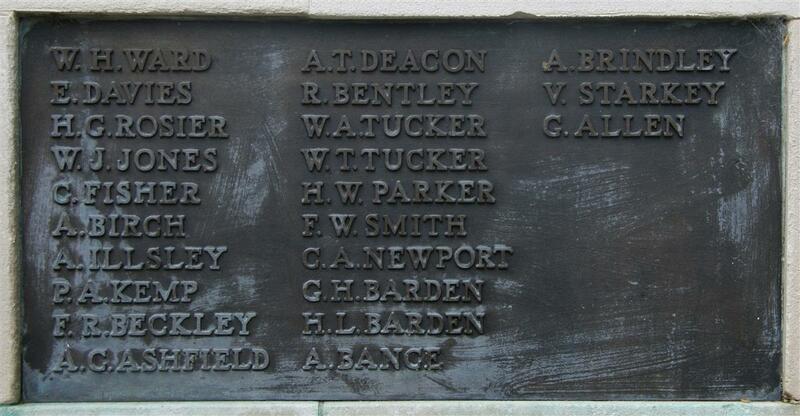 Immediately above his name on the Newbury memorial is that of W A Tucker – William’s younger brother Walter. Walter died in a sanatorium in Abingdon, where he succumbed to tuberculosis contracted during his time as a prisoner of war in Germany; he served with the 2nd Battalion, Worcestershire Regiment. His name is not recorded in the Commonwealth War Graves Commission's 'Debt of Honour' database or on any of their memorials. Evidence is being gathered to support an application to add this forgotten soldier's name to the national roll of honour. Their brother Edwin also saw service, with the Oxfordshire and Buckinghamshire Light Infantry; thankfully he survived the experience. The fourth brother, Charlie, was too young to serve.